After nearly a decade, Slow Food USA gathers this week in Denver to chart a course for the future of food. Movement leaders share their reflections, hopes, and concerns. When an estimated 50,000 activists, eaters, and food systems thinkers gathered for Slow Food Nation in San Francisco in 2008, it was with the goal of “catalyzing a huge shift in how Americans perceive and prioritize food.” And, by many accounts, it worked. Nine years later, farm-to-plate is a household term, but greenwashing and “localwashing” is nearly as abundant as farmers’ market kale. Nearly every week we hear examples of the way the food industry has responded to consumers’ questions about the source of their food—in both real and disingenuous ways. And after eight years of forward movement in Washington, D.C., the Trump administration is now hard at work to slash regulations and funding in rural areas, create a climate of fear among immigrant farmworkers, and do away with recent school lunch gains, potentially setting food systems progress back a generation. It’s against this national backdrop that Slow Food USA, the domestic branch of the international group founded by Carlo Petrini, is hosting its latest national gathering. 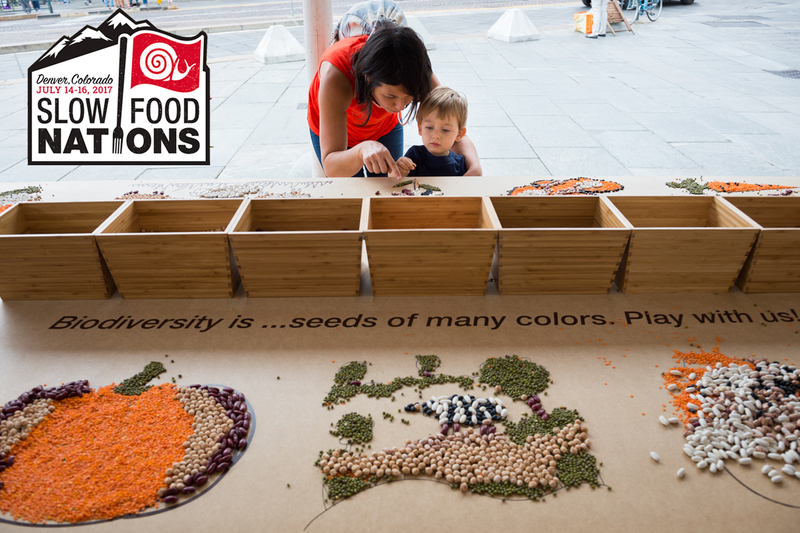 Slow Food Nations will bring together approximately 500 food and farm leaders from around the nation (and several from outside the U.S.) for an internal summit in Denver, Colorado, followed by a three-day street festival on July 14-16. The plan, says Richard McCarthy, executive director of Slow Food USA, “is to reach those who’ve just come to the table and seek how best to navigate good food choices.” And with interactive workshops, tastings, farm tours, educational talks, and hosted meals, the organization will likely reach that goal. But at a time when food is one of the more accessible lenses on justice, the group—and the larger food movement—has higher ideals as well. Alice Waters, chef and owner of the iconic Chez Panisse restaurant in Berkeley, California, and founder of The Edible Schoolyard Project, is going to cook a meal for Slow Food leaders in hopes that she can encourage the group to get on the same page about the value of free, sustainable school lunch for all students K-12. The larger goal, she says, is to make school lunch an academic subject and a part of the curriculum. This provides a nourishing school lunch to all children and, most importantly, gives them time to sit down and eat together. The gathering in Denver will be a place to take stock of the last decade of change and growth in the good food movement. Waters points to the online Edible Schoolyard Network, which today consists of 5,500 school gardens, kitchens, school cafeterias, and academic classrooms worldwide, as an example of this very real momentum. McCarthy says the movement should be proud of what it has accomplished. Ten years ago, “school gardens, DIY baking and canning, farmers’ markets as strategic mechanisms to trigger consumer change for vulnerable families … these were considered to be boutique, fuddy-duddy, or distractions from the real issues,” he says. But, he adds that “the combined effects of civil society persistence, growing market pressures, and occasional wise public policies have conspired to aid everyday people make the cultural shift to begin to value food differently in our lives.” These changes are especially remarkable given how little funding has gone into the effort, says McCarthy. Slow Food began in 1986 when Petrini and a group of activists staged a protest at the planned site of a McDonald’s at the Spanish Steps in Rome. That history of resistance, says Ricardo Salvador, director of the Food & Environment Program at the Union of Concerned Scientists (UCS), offers an opportunity to continue thinking about what’s behind the curtain. “That self-awareness and alternative worldview rooted in egalitarianism and ecology is needed now, as ever,” says Salvador, who will be speaking on two panels with his colleagues José Oliva of the Food Chain Workers Alliance (FCWA) and Navina Khanna of the HEAL Food Alliance. Both UCS and FCWA are members of the burgeoning alliance, which seeks to transform the food system from a perspective that is rooted in social and racial justice. This vision would be a far cry from the wine-and-cheese-club image that Slow Food has often been subject to over the years. “This caricature conforms rather nicely with similar arguments intended to discredit proponents of the soda tax, tobacco legislation, and other excesses of the ‘nanny state.’ So, first of all, it’s a purposeful and cynical portrait of us as elitists,” says McCarthy. And yet, he makes clear that the organization is still focused on promoting the idea of a universal right to pleasure, and the Denver event is clearly an effort to balance foodie culture (or cocktail culture) with more thought-provoking discussion. A group of coffee-focused panelists will look at the beverage through a climate change lens, for instance. In the end, McCarthy is clear about the fact that the delicious part of Slow Food’s work is as important to the organization as the political. “[Slow Food’s] ideas are more relevant than ever before; and people are thirsting for change,” he says. Photos courtesy of Slow Food USA; Civil Eats is a media partner of Slow Food Nations. Great piece. Thrilled to hear about all of the discussions that will be happening in Denver and excited to see what comes of it. For me, living in Philadelphia and working farmers markets, I see the strong disconnect between the affluent and the vulnerable every week. I am deeply interested in bridging that gap and talking more about how we can achieve that. Thanks! You might also enjoy seeing my story about Slow Food, which published at USAToday.com - written after I served as a Slow Food USA delegate to the international conference held at Turin, Italy, in fall 2014.